We seem to be inside a "local bubble" in a network of cavities in the interstellar medium, probably carved by massive star explosions millions of years ago. The interstellar medium (or ISM) is the matter that exists in the space between the star systems in a galaxy. This matter includes gas in ionic, atomic, and molecular form, dust, and cosmic rays. It fills interstellar space and blends smoothly into the surrounding intergalactic space. NASA astronomer's best guess is depicted in the map (below) of the surrounding 1500 light years constructed from multiple observations and deductions. Currently, the Sun is passing through a Local Interstellar Cloud (LIC), shown in violet, which is flowing away from the Scorpius-Centaurus Association of young stars (image above). The Gum Nebula, shown above and below in green, is a region of hot ionized hydrogen gas. This complex nebula is thought to be a supernova remnant over a million years old, sprawling across the southern constellations Vela and Puppis. 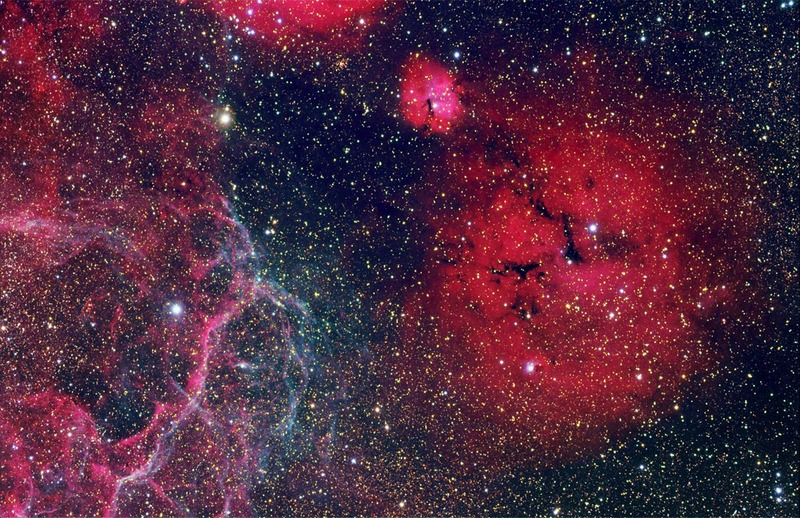 Inside the Gum Nebula is the Vela Supernova Remnant, shown in pink, which is expanding to create fragmented shells of material like the LIC. Future observations will aid astronomers to learn more about the local Galactic Neighborhood and how it might have affected Earth's past climate.